Pit Bull Pride of Delaware receives on average 20 to 25 urgent pleas each week from shelters to help save dogs! While we would love to be able to rescue every dog, as a small foster-based rescue, sadly we cannot. Many times these dogs are not just homeless and at risk for euthanasia they are also in need of urgent medical care! Cold, injured, and alone, a helpless dog lies desperate for assistance on the side of the road. She was struck by the car of a careless driver who not only did not alert the authorities of the accident, but left the then crippled dog for dead. She was unable to walk or tend to her many serious wounds on her own. The worst part might be that no one knew who she was, or that she was missing. Monday, April 2, 2012, a local man was walking his son to the bus stop when they heard a sound that could make one’s blood chill, and heart break. As the man further investigated the source of the sound he found the severely injured pit bull in a ditch next to the bus stop, whimpering and writhing in pain as her final plea for help. This man, being a good Samaritan and having a dog of his own, found the compassion in his heart to transport the hurt pit bull to the local Veterinary Specialty Center of Delaware. His decision to protect this innocent being, who he did not even know, would soon put a movement into place that would effect the lives of many people. 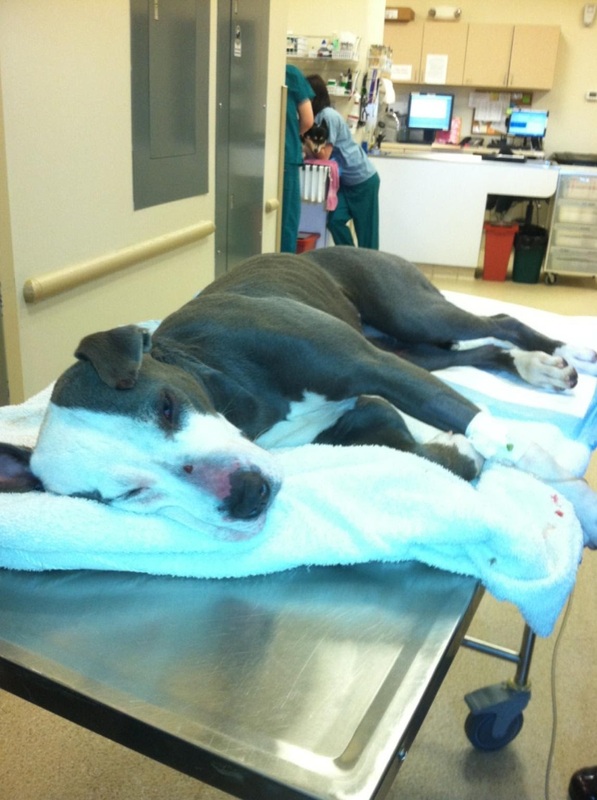 Upon receiving the injured pit bull, the veterinary center evaluated the state of her health and contacted Pit Bull Pride of Delaware, an organization dedicated to the rescue and care for pit bulls. Lauren Verfaillie Ramone , founder of Pit Bull Pride of Delaware, along with Brittany Anthony, former co-founder of Pit bull Pride of Delaware arrived at the veterinary center to sign custody paperwork for the pit bull and to find out what it is going to take to save this poor girl from her fate if left without medical attention. Coincidentally, the man who brought her in was in the waiting room for a vet visit with his own dog. Lauren and Brittany were given the unique opportunity to thank him for his selfless actions. Dr. Mark A. Cofone VMD, DACVS, informed Lauren that the dog had broken vertebrae, and a shifted spinal chord. Combined with previous neglect, and malnourishment from before the current injuries, the surgery and after care/ rehabilitation was going to cost over $5,000. Out of the faith held in the good nature of their network, Pit Bull Pride of Delaware immediately set up a website for friends, family, and dog lovers alike to donate toward saving this beautiful girls life. Donations rolled in, one after another. Before we knew it, the community had donated over $2,000 in 24 hours and the Veterinary Specialty Center of DE went forward with the surgery on Wednesday, April 4, 2012. With only a thirty percent chance of being able to even walk again, Lauren and Brittany started calling the dog Grace. Grace started alone, and damaged; today, she captured the hearts of hundreds who have watched her story unfold. In the face of adversity, in an otherwise impossible situation, Grace has beaten the odds because of the love shown by the supporters of Pit Bull Pride of Delaware. Picture to the left, was taken the day she was brought into the vet on 4/2/12. Grace beat all of the odds against her and stood up the day after surgery. This is Grace on 4/19/12, in her loving foster home where she recovered from her broken vertebrae. She is our sweet “Saving Grace” and she has been an inspiration to the entire pit bull community. Her foster family fell in love with her and completed her adoption on May 31, 2012. She is a normal dog and has no restrictions. She run, plays, jumps, and plays. Your are our inspiration Grace. You will always be in our hearts! Pit Bull Pride of Delaware, Inc. will forever be grateful and blessed to have received the phone call about Serenity. We were told of her whereabouts and that she was pregnant, unwanted, and in bad shape. We knew she had been there for quite some time, but had no idea of the true horror we would all soon endure. We begged the voice on the other end of the phone for more information – who did this? Why? Are there others? Serenity made it into foster care and the safe haven of an emergency veterinary facility. Fully pregnant with at least eight puppies, she is severely malnourished, weighing less than forty pounds. The veterinary center determined that she had endured previous bone fractures, which were never medically treated. It was then that we knew that true hell existed in our own backyards. She appeared to have been raped – tied down, forced to breed – kicked, beat, and subsequently cast aside. She was “unnecessary” now; tossed outside and ignored. Just like garbage. After suffering, lying still and alone, through broken bones without care, covered in thousands of fleas, painful starvation and thirst…somehow…beyond all doubts and odds…Serenity survived. Refusal to deter or turn our backs on help and hope for any dog. There is a saying within the rescue community about dogs that are bred and forced to fight: “the lucky ones die fighting.” Law enforcement within the U.S. has reported kids as young as ten and eleven training and fighting dogs. These dogs are severely abused, kicked and thrown, starved and forced to fight for food. “Winners” and “good breeders” will continue to suffer in a world of pain, where no remedy is provided. Yet, their innate serenity and grace from within creates a “need to please” their owners. These dogs have such a strong desire to please; they internally digest each bruise and flesh wound in an effort to remain loyal –that is a true “pit-bull’s” fighting spirit. 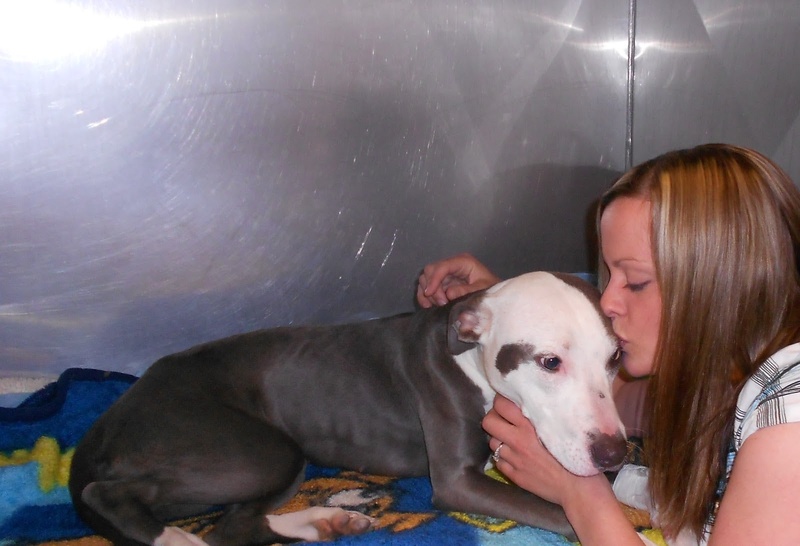 Everyone who has met Serenity sees something special in her, and wants to help save her. Usually, dogs that are seized in illegal fighting rings become euthanized. We could not let this be Serenity’s future! She is one of the sweetest dogs one could ever hope to meet. She is already living up to her name and royal title. Serenity is the type of dog you want to get out of bed to go downstairs and sleep on the floor with – she won’t just lie at your feet, she will lie on your feet! She was the proud mama of 8 pups – and we all enjoyed our chance to be down on the floor with her and them. Pit Bull Pride of Delaware, Inc. added a promise to our “Refusal Pact” with Serenity; we promised her we will help to close the door to her bruised and battered past, and welcome her and her precious babies into a bright new open door – filled with light, love, and hope  At some point in life, every living being deserves to know their value and purpose. Serenity is now learning hers every day. Serenity is teaching us how to overcome incomprehensible odds, and push forward through life, with optimism and grace. Serenity was very patient and this sweet girl found her perfect forever family with her foster family! Adopted 2/14/13!! ALFIE, A TRUE BREED AMBASSADOR! Alfie went right in to the perfect home with his WONDERFUL foster Mommy and he had her heart from day 1. Alfie spent countless hours at the vet with her and she did everything needed to nurse him back to health. She made him her’s on December 15th, 2012! Phoenix was relinquished to Faithful Friends Animal Society on 11/14/12. He could barely lift his head, could not open his mouth, and could not stand. They had a vet come to the shelter to see him immediately. They instantly gave him fluids and tried to determine what they were going to do next. We are so grateful that they did everything they could for him while he was there. Our founder received a phone call from them almost immediately. She agreed to meet them at Veterinary Specialty Center of Delaware as soon as she heard what happened to the dog. 5 Pit bull Pride of Delaware volunteers waited anxiously for him to arrive and to join the Pit Bull Pride of Delaware family. When he first arrived into our care we were not sure if he was going to survive the night. He was admitted into the emergency center because he needed 24 hour observation. When Phoenix was first taken in by PBP his chances of survival were slim, he was deprived of food by his previous owners for so long that his body was giving up, despite what… was done to him at the hands of humans, he fought for his life and proved everyone wrong by pulling through and becoming a loving member of our pack! Phoenix has come such a long way and we couldn’t be happier that the Wilhere Family saw his true potential and decided to make him a part if their family. He will never again know abuse or neglect! Congrats sweet boy, you’ve been an inspiration to all of us! Not only has Phoenix recovered and gained 17 lbs in less two months, he was adopted by his forever family on 12/23/12. He was our Christmas angel this year and we have made sure he is never mistreated again! Congrats Phoenix, we love you! OUR SILVER BELLE FOUND HER HAPPILY EVER AFTER! She enjoyed the start of her new life with Alfie’s foster Mommy, there was no better place. Just like her foster brother Alfie she spent countless hours at the vet until she made a full recovery and was adopted by an EXTREMELY loving family 5/18/2013!!!! Cinderella’s adopted Mommy visited her over and over and over until she was ready to go to her forever home! Cinderella get her Fairy Tale Ending! JOSEPHINE MARIA, aka JOSIE’S, journey! Pit bulls. They need a home ASAP. Carol’s daughter rescued them and she died suddenly. Carol can not take care of the animals. Plus she must sell her home since she can no longer afford it with out her daughters income. Please help her or the dogs will be put euthanized. Her name is Carol Burkholder. 443-553-9714. She resides at. 7 Havertown rd. Robscott Manor. Newark,DE. Hi Stephanie, we are terribly sorry to hear this. PBP of DE is a small, 100% foster/volunteer based organization that cares for approximately 8-10 “pit bull type” dogs at a time. Our organization mainly works with high-kill shelters in Delaware, Maryland, New Jersey and Pennsylvania. On an average week, we receive 15-20 urgent pleas from high-kill shelters (these dogs are highly adoptable, but sadly are euthanized for space) and 5 to 10 owner surrender requests. While we would absolutely love to save every dog, the sad reality is we just cannot. While every animal deserves a chance, *approximately 9,000 dogs and cats die in shelters in the United States DAILY, simply because they have no place to call home. That’s more than 3 million unnecessary deaths a year. A true, present-day tragedy. Based on these statistics and because owning a pet is a life-time commitment, we hope she can reconsider her request and can make the necessary adjustments to keep these dogs in a loving home. They are lucky to have someone that cares. PBP of DE strongly recommends Pit Bull Rescue Central for assistance and advice on how to safely find a new home on your own: http://www.pbrc.net/adoption/owners.html. We REALLY need to public to help in these efforts to help save more pups lives. If after she has exhausted all options, still needs help, and please have her email us with pictures to our Owner Surrender Coordinator at ownersurrender@pitbullprideofdelaware.org. Please be aware this is not a quick process, as explained above, we are a small rescue receiving an overwhelming amount of pleas daily, therefore there is a waiting list and this is the 1st step to be added to that list (estimated turnaround time for intake is 2-3 months). The 2nd step is a face to face evaluation, but since we are 100% volunteer based we would not take the time to do this until we are in a position to possibly take in her dog(s). Her dog(s) must be dog and kid friendly to be considered, as all our fosters have 1 or both. We will contact you if and when we have an opening. My friends are moving out of town and cannot take their Pittbull, Alpha, and I cannot take him and we’ve attempted other options, but they and I are at a loss and the dog needs a home by September 12. Alpha will be 2 in October, he has been Neutered and microchipped. He is current on all his shots. He is a sweet boy who needs lots of love and attention. Please call me ASAP. Please call me asap and tell me either where to bring him or make suggestions. I/We are at our wits end. We are very sorry to hear of this situation. PBP of DE is a small, 100% foster/volunteer based organization caring and advocating for “pit bull type” dogs. Our organization mainly works with high-kill shelters in Delaware, Maryland, New Jersey and Pennsylvania. On an average week, we receive 20-25 urgent pleas from high-kill shelters (these dogs are highly adoptable, but sadly are euthanized for space) and 5 to 10 owner surrender requests. We rarely have the resources to take in urgent cases from shelters or owner surrenders. While we would absolutely love to save every dog, the sad reality is we just cannot. You may not know this but sadly pit bulls are the most abused and over bred dog in the US. It is estimated that only 1 out of 600 pit bull type dogs ever make it out of a shelter system. While every animal deserves a chance, *approximately 9,000 dogs and cats die in shelters in the United States DAILY, simply because they have no place to call home. That’s more than 3 million unnecessary deaths a year. A true, present-day tragedy. 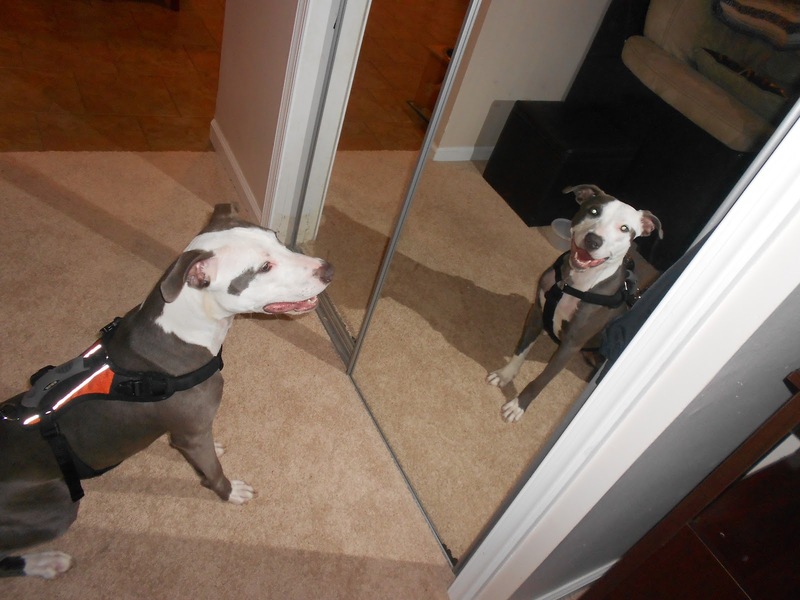 PBP of DE strongly recommends Pit Bull Rescue Central for assistance and advice on how to safely find a new home on your own: http://www.pbrc.net/adoption/owners.html. We REALLY need to public to help in these efforts to help save more pups lives. Thank you for rescuing her. Please contact Faithful Friends they now have a low cost vet clinic.